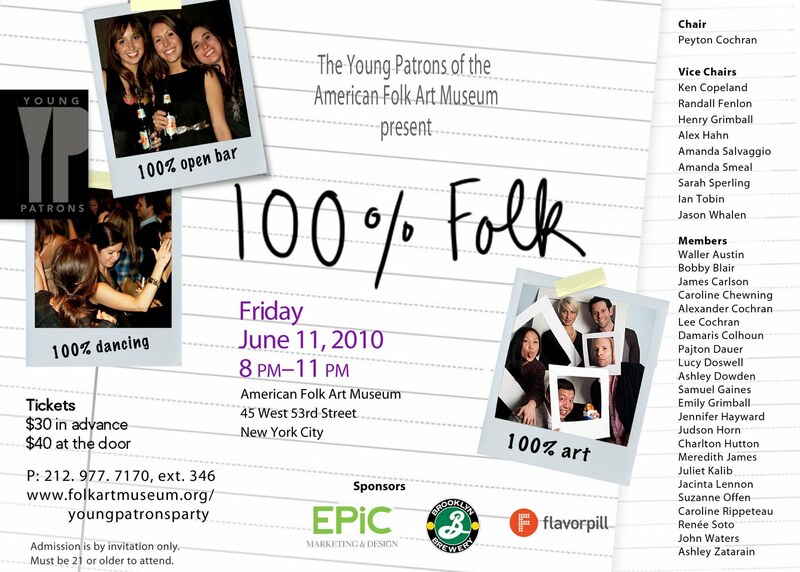 After last month's successful contest for tickets to an intimate Patti Smith concert at The American Folk Art Museum, the museum has given us two pairs of tickets to giveaway to its Young Patrons Party this Friday evening. The free tickets -- which are normally $30 each in advance and $40 each at the door -- will get you a three hour open bar in the museum’s stunning atrium, while you enjoy DJ sets and access to the museum's exhibitions among other surprises. 1) If you don't already "like" NYCDAILYDEALS on Facebook, visit facebook.com/nycdailydeals or click the icon on the right side of this post to "like" us. In order to be eligible, you must "like" NYCDAILYDEALS on Facebook. 2) Send an e-mail to folk53@folkartmuseum.org with NYCDAILYDEALS & your name in the subject line (For example NYCDAILYDEALS / John Smith). The contest will close on Monday evening at 11:59 PM. A winner will be selected at random and be notified on Tuesday.